The airshow at RAF Cosford and reviews of the 2018 and earlier shows. The RAF Cosford Airshow used to be the second biggest of the RAF airshows after Waddington. After 2014, in the absence of the Waddington Airshow, it became not only the main, but the only, airshow directly organised and managed by the RAF. RIAT at RAF Fairford, although on an RAF base, is organised by the RAF Charitable Trust (RAFCT), not the RAF, as was the airshow at RAF Scampton held in 2017. The 2019 show promises 6 hours of flying as well as the usual excellent static, hangar and outside displays. 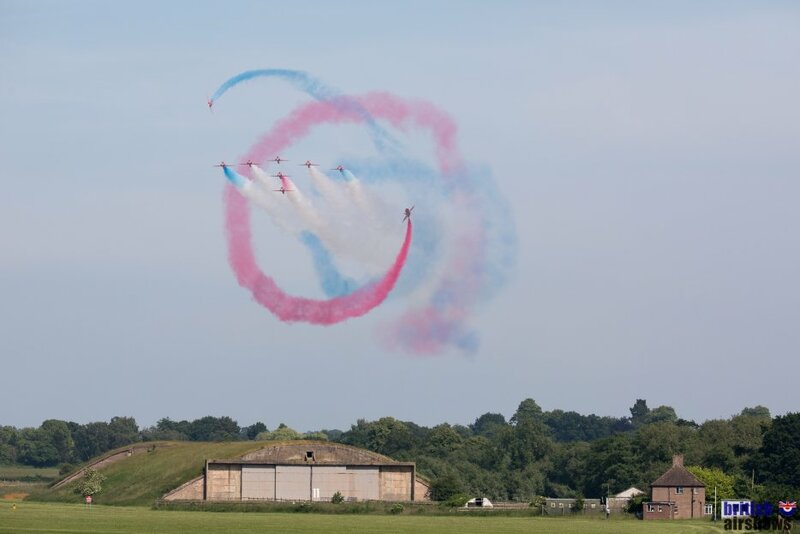 The Red Arrows will have a vey short UK season this year because of their North American tour, which results in the UK part of their 2019 schedule being curtailed in mid-July. They will, however, keep faith with the only RAF-organised show when they fly at the RAF Cosford. "We're excited to be welcoming the Red Arrows, once again, to the RAF Cosford Air Show this summer. They are always one of the most spectacular displays and I’m sure they will be a highlight of the day for all of our visitors." The first flying display announcement was the Swiss Air Force F/A-18C Hornet, which has two UK displays this year. The first will be here at the RAF Cosford Airshow. 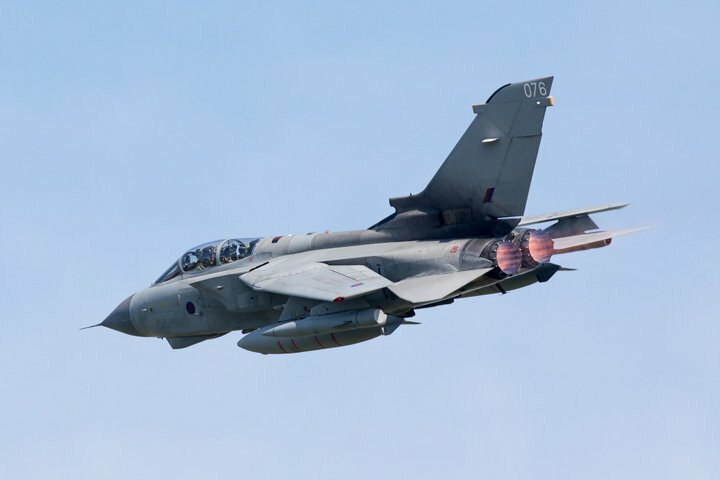 The only other UK display planned for 2019 will be at RIAT. The German Navy will be sending a P-3C Orion maritime patrol aircraft for the flying display and a Westland Sea Lynx Mk.88A for the static display and the Royal Danish Air Force's "Baby Blue" Display Team will be at the RAF Cosford Airshow for the first time ever, performing in the flying display in their four SAAB T-17 Supporter aircraft. The RAF Cosford Air Show will also be one of only 13 public shows to see the RAF Chinook display in 2019. One of the feature displays at the show will be a WWII set piece. The first fighter to be announced for this part of the display is Hawker Hurricane G-HITT 'P3717'. More components of the feature will be announced in the coming weeks. "We're very excited to have the Czech Air Force participating at this year's Air Show, becoming the 4th nation to confirm aircraft attendance so far. The participation of the Czech Air Force is particularly notable for us due to RAF Cosford's role as a Czechoslovak Depot during WWII, where thousands of Czech airmen enrolled to the Royal Air Force." Another east-european debutant in the NATO celebration area will be the Slovak Air Force with their LET-410, joining other NATO aircraft on static display such as a German Sea Lynx and a Belgian SF.260M. A second SF.260 will make a speial flypast. "We’re grateful to the Slovak Air Force for supporting the RAF Cosford Air Show 2019 with this interesting aircraft, which will be a great addition to our NATO celebration." In addition to the flying, a Vintage Village will focus on WWII, with the sights, sounds and smells of the era. Re-enactors will help create a realistic WWII atmosphere around vintage aircraft and vehicles, both military and civilian, a Village Pub and a church fete. A variety of musical acts will perform on the bandstand whilst in a marquee there will be teas and vintage items for sale. The RAF Cosford Air Show is introducing a food fayre on the showground to promote local food businesses. Email the show (not us) for more details. RAF Cosford was built in 1938 as a training, storage and maintenance base and remains a training base even now, accommodating several RAF and general aviation schools. Other uses have been a major RAF hospital from 1940 until 1977 and an RAF POW repatriation centre after WWll. As well as training schools, there is also an aerospace museum: part of the RAF museum, which houses mostly developmental aircraft including one of only two existing TSR2s. It is also the only museum that has one of each of the three 'V' bombers in the same place - The Valiant, Victor and the Vulcan. An RAF Zone will showcase the very best of today’s Royal Air Force. As well as hands-on displays and exhibitions from all aspects of the Royal Air Force, including a mock-up Chinook helicopter. A number of Royal Air Force display teams will have a ground presence in the RAF Village, with opportunities to meet the pilots and to explore the range of RAF Careers available as both a Regular or Reservist. Hangar displays will show what training to become qualified RAF Technicians and Engineers is like. There will be displays from the Defence School of Aeronautic Engineering, No.1 Radio School, Defence School of Photography, RAF School of Physical Education and others. Two STEM Hangars have become well-reputed attractions at the Air Show, showcasing the best that the RAF, Industry and Academia have to offer in the fields of Science, Technology, Engineering and Maths and offering hands-on experience of several trades. The RAF Cosford Airshow 2018 was selected to be one of the major British airshows to celebrate the centenary of the RAF, and they did it in style. Right from the outset the organisers promised a range of aircraft to represent the 100 years since the RAF was formed from the former Royal Flying Corps and the Royal Naval Air Service to become the world's first independent air force. And that is exactly what they delivered. The show categorised the 100 years into four eras and both the static and aerial displays followed the themes for the eras: 'Policing the Empire', when the RAF helped to secure the integrity of the pre-war British Empire; 'The World at War', when the RAF's aircraft developed to meet the needs of conflict; 'The Age of Uncertainty', when war was 'cold' rather than physical and aircraft were developed to become faster and to carry more threatening weapons; and the 'New Millennium', when science and technology are as significant as brute force in the maintenance of peace in our own time. There had been some criticism at earlier RAF Cosford airshows that the static displays were scattered, possibly cramped, and disguised in muddled settings. There can be absolutely no such criticism of the RAF100 static displays. Aircraft were brought by air and by road, some, such as the Boulton Paul Defiant, a short distance from the very co-operative museum on the same site but some, such as the Phantom McDonnell Douglas F-4K Phantom ‘Black Mike’, as many as 346 miles from Leuchars in Scotland. The gathering of the static displays had taken place over many months and further work to arrange, paint and polish the exhibits is witness to the determination of the organisers to offer the best possible example of the history of the RAF through its aircraft. F-16, Belgian Air Force "Best presented Aircraft"
The static aircraft were presented in a series of 'villages', each representing the theme of its era, in chronological order, starting at the western end of the showground when the newly-formed RAF was 'Policing the Empire' and progressing eastwards until the 'New Millennium' displays were, appropriately, adjacent to the hangars housing the STEM activities towards the eastern end. Each of the villages was populated not just with the aircraft but also with equipment and re-enactors, bringing history to life in the context of the RAF and the population it has protected over the century. Although the war was virtually over by the time the Royal Flying Corps and Royal Naval Air Service became the Royal Air Force on 1st April 1918, Great War aircraft still dominated the 'Policing the Empire' era, gradually giving way to the new inter-war designs. Both were on display in the village alongside living history re-enactors providing the ambience of the early post-WW1 years when the RAF was in its infancy. After the war came an ‘Age of Uncertainty’ including the era better known as the ‘cold war’. A highlight of the zone representing this era was the F-4M Phantom FG.1 XV582 ‘Black Mike’. The Phantom was operated by the Royal Air Force between 1969 and 1992, principally as an air defence fighter. Although the jet was an American design, produced by McDonnell Douglas, the UK’s Phantoms were a special batch built separately and containing a significant amount of British technology, including the addition of Rolls-Royce Spey engines. Of all the UK’s Phantoms this airframe is perhaps one of the most iconic. It's name ‘Black Mike’ comes from its unique paint scheme applied by 111(F) Squadron in the late 1980s. On 24th February 1988 ‘Black Mike’ was flown the 590 miles from Land's End to John O'Groats in 46 minutes, earning two speed records in the process. Also displayed in this zone were other favourites of the sell-out 60,000 crowd; the Gloster F9/40 Meteor, which normally lives in the nearby RAF Museum, and the Cornwall Aviation Heritage Centre's English Electric Lightning F.53. This area also had privately-owned Jet Provosts, including a Jet Provost T3a in Red Pelicans colours, which has not been seen on the UK airshow circuit for over a decade. Not only were there rarely-seen aircraft but there were aircraft that, although seen individually, have not been seen together, in context with each other, for very many years. The ‘New Millennium’ village brought the RAF story up to date and featured full-scale replicas of the Typhoon and the F-35B as well as other current (such as the Tornado) and recent (such as the Jaguar) RAF aircraft, as well as the first glimpse for many of the RAF's new Juno and Jupiter helicopters. This was possibly the least well populated area, missing some of the headline aircraft of the last 18 years, although there were plenty of Jaguars to be seen just off the main display area at the extreme west of the static display line and yet more teasingly outside hangars across the runway to the south of the showground. Perhaps as important as the aircraft, RAF personnel and partners from industry were in this 'New Millennium' area, and in another STEM hangar in the centre of the static displays, to demonstrate the skills of the many trades that are learnt and taught at RAF Cosford, giving visitors a chance to see, and possibly to try their hand at some of them in hangars devoted to encouraging Science, Technology, Engineering and Mathematics (STEM) activities. And there is nowhere better to encourage STEM than at RAF Cosford, a major part of the Defence College of Technical Training. As well as the mind, the physique was given a work-over, too, with plenty of opportunities to test strength and skill under the supervision of trainers in the lifestyle hangar. In the air there was a six-hour display programme starting at around 11.30. In the last few years the flying programme has been decimated, even curtailed, by unfavourable weather and cancellations. There were few such problems this year. Thankfully, the weather was dry and reasonably clear, although cloud and some haze that persisted for much of the early part of the display time, and the south-facing display line into a bright, albeit hidden, sun, did make photography a little challenging for the first few hours. Cancellations were fewer, too. IWM's MK1 Spitfire and Vampire Preservation Group's Vampire T11 were the only full display cancellations. Perhaps equally disappointing, the proposed flypast by the Royal Netherlands Air Force KDC-10 was not possible because the aircraft was unserviceable. The remainder of the programme ran unusually (for any airshow) close to the published schedule. 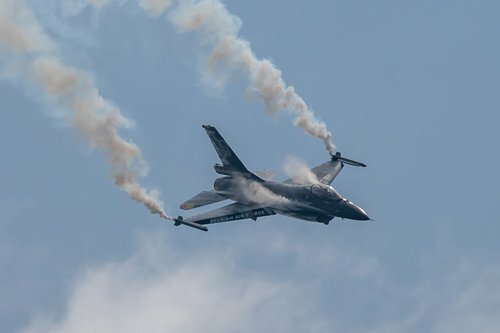 One change that caught out a few was the Belgian F-16, one of the headline displays, which was brought forward quite significantly and surprised and disappointed many who had not reached the crowdline from the static displays, or even reached the showground at all due to slow traffic. Following what has become an RAF Cosford tradition, displays were opened by the RAF Falcons. Because of the fair weather, and unusually for the venue, the drop from a Dornier 228 was at 9,000 feet, enabling several thousand feet of freefall before the team opened their 'chutes and displayed their aerial manoeuvres, coming to land traditionally close to the marked zone. After landing and securing their equipment, the salute was followed by the presentation of the RAF100 baton, which had been carried during the drop. The flying followed the same chronological pattern as the static displays, punctuated by displays from the european and Commonwealth military . This worked well. A fully chronological order would have left all the fast jets grouped at the end which, although providing an exciting end to the programme, would have left the remainder of the day a little unpaced. The order also allowed for a very impressive mix of fixed wing and rotary aircraft, which almost alternated in the middle of the day. 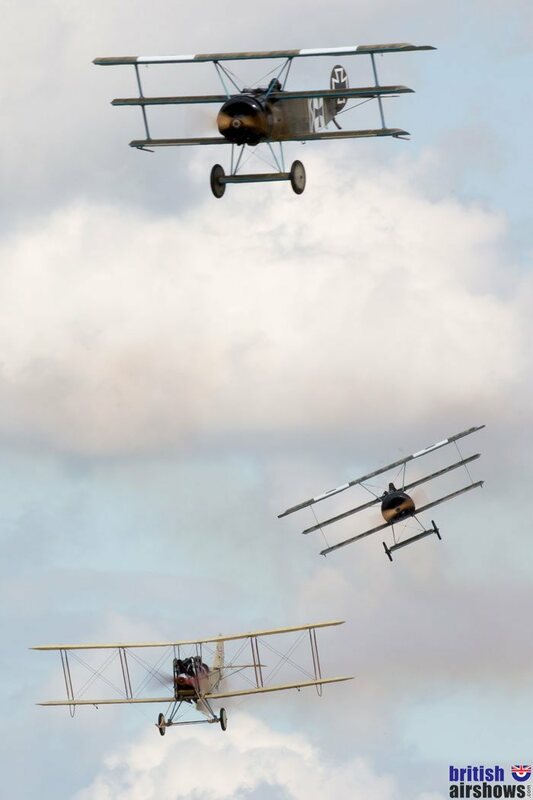 The Bremont Great War Display Team began the flying action with four, rather than the advertised three, examples in the form of the RAF BE2c, Avro 504K and a pair of RAF SE5a replicas representing the type of aircraft that were inherited by the RAF at its formation 100 years earlier. Before eight of the Tiger 9 team displayed their de Havilland DH82a Tiger Moths there was the first of the european jet displays. 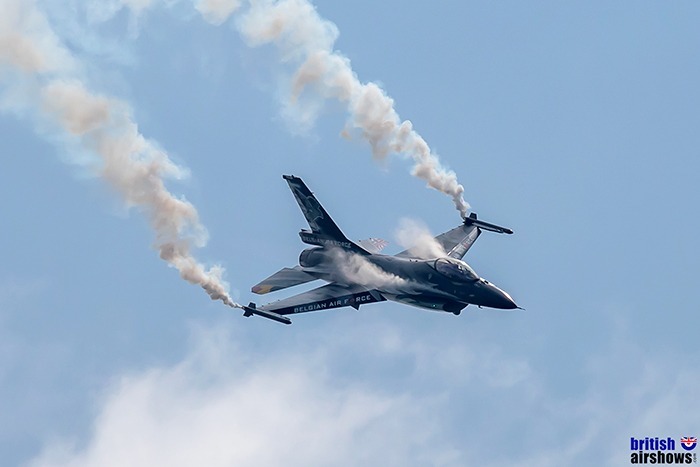 This was the much-anticipated F-16AM 'Fighting Falcon' from the Belgian Air Force flown in the first public display for team's solo display pilot for the next three years, Senior captain aviator Stephan "Vador" Darte. The aircraft livery has been updated for the season in a striking scheme nicknamed 'Dark Falcon'. It clearly made an impression, earning the award for the 'Best Presented Aircraft at the RAF Cosford Air Show 2018'. As well as the overall new paint scheme, the F-16 sported a union flag on its left horizontal stabilizer, balancing the Belgian flag on the other side: a very nice touch that the team say will be replicated when they perform other displays abroad. As well as the first Belgian F-16 display of the season, another first for the show was Charlie Brown's display of the Historic Aircraft Collection's Hawker Fury 1, which has never before been flown away from its Duxford home. Dave Pulleston flew Anglia Aircraft Restoration's Hawker Hurricane Mk 1. Following the solo display the Hurricane was flown back onto the display line, this time accompanied by the Polish Air Force MiG-29, emphasising the close bond between the British and Polish air forces around WW2 which endures to this day. The MiG-29 then went on to perform its own solo display. The display MiG was from the 1st Tactical Squadron of the Polish Air Force, which can trace its history back to the RAF's 303 Squadron, manned by Polish pilots during the Battle of Britain. All MiG-29 jets operated by the squadron have the portrait of a pilot on the tail fin in recognition of the contribution and sacrifice made by 145 Polish pilots during the war. As well as the Belgian F-16 and the Polish MiG-29, another contribution from Europe was made by the French Air Force, who displayed their solo Dassault Rafale. This sported another of the season's new paint schemes, a black-and-red design as flamboyant as the performance by Capitaine Sébastien "Babouc" Nativel, which won him the Hartree Memorial Award for the best flying display. Larger aircraft always make an impact at airshows and the RAF Cosford Air Show certainly had its share. But there were none as big and none had travelled as far as the Royal New Zealand Air Force Boeing 757. The RNZAF Fixed Wing Transport Force has two 757-2K2 aircraft. Officially they provide strategic airlift capability to carry personnel and equipment as well as VIP transport and ministerial and trade missions worldwide. Thankfully, we can add 'air displays' to that list of purposes. And display it certainly did, with fast and slow runs, plenty of topside and a steep climb out. It is very impressive, and equally unusual, to see such a large aircraft display over a relatively small showground. Helicopters played a major part in the airshow. There were no fewer than seven involved in displays and a further two in a flypast. Of course, a superb display by the RAF Chinook HC6A, flown by 'local' captain Flt Lt Stu 'Kyno' Kynaston was a huge attraction but enthusiasts were even more excited by the two contributions from the Flying Bulls. The first of their helicopters to display was the Bolkow Bo105, a highly manoeuvrable aerobatic machine from which the Eurocopter EC135 was developed. The Chief Helicopter Pilot of the Flying Bulls, Siegfried "Blacky" Schwarz, has won the Freestyle World Championship in this helicopter twice. His display demonstrated some of the moves that earned him that accolade, including spins, inversions and rolls that no other helicopter can match. But the undoubted highlight was when the same pilot from the same team displayed the world's only flying Bristol 171 Sycamore, in its UK debut since being acquired and restored by the Flying Bulls. The Sycamore was the first British-designed helicopter to enter production and served with the Royal Air Force between 1953-1972, although this one came from the German military. Siegfried is the only pilot qualified to fly the Sycamore, which has heavy mechanical controls and none of the electronic assistance available to pilots of modern rotary-winged aircraft. Other vintage helicopters in the flying schedule were the Westland Whirlwind HAR10, a British licence-built version of the U.S. Sikorsky H-19, a type that served with the Royal Navy and with the RAF in search and rescue until they were replaced by Sea Kings in the mid-sixties, and a pair of Westland Gazelles from the Gazelle Squadron. Apart from the Chinook, other military helicopters were the Agusta A109, the second contribution to the show from the Belgian Air Force, and a flypast by a pair of the latest helicopters to enter RAF service: the H135 Juno, which replaces the Squirrel HT1 as a basic rotary wing trainer at the Defence Helicopter Flying School, and the H145 Jupiter, both based at nearby RAF Shawbury. The RAF's Battle of Britain Memorial Flight presented their 'Trenchard' formation incorporating the Dakota, closely followed by the Lancaster, escorted by their Mk lX Spitfire and Hurricane Mk llc. 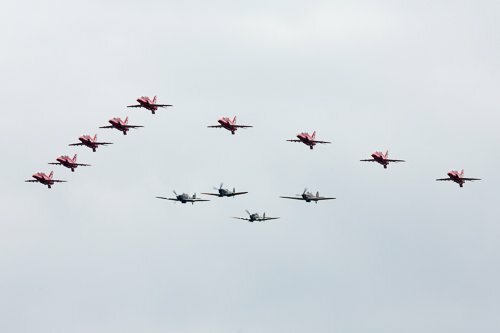 The formation, introduced for the RAF's centenary year and named after 1st Viscount Hugh Montague Trenchard, who was instrumental in establishing the Royal Air Force, is designed to honour current members of the Royal Air Force and all those who have served over its past 100 years. The foursome arrived over the crowd with the Dakota leading and flew a formation circuit before the fighters peeled off to enable the component aircraft to perform their respective displays. The Trenchard formation was due to be seen four times in the RAF100 year: the first at Torbay, the second here at RAF Cosford, the third at Weston-Super-Mare and the last at RIAT. However, the fighters were not able to join the formation at Torbay, so in practice the display at RAF Cosford was the first of three Trenchard Formation displays in 2018. As well as the BBMF, the RAF sent one of the best selections of current RAF aircraft seen at any show. The RAF's own 90-minute finale to the show began with the Red Arrows who, thankfully, flew the traditional axis at right angles to the crowdline, rather than the oblique axis that caused so much disappointment in 2017. Two new manoeuvres have been introduced to celebrate the RAF100 and, as conditions were fine for a full display, appropriately both could be witnessed at this RAF100 show. The first was the Centenary Split, ending the formation flying half of the show. This involves seven aircraft dispersing in a vertical fan with white smoke whilst the remaining pair exit horizontally exhausting red and blue smoke. This has become a part of the full display and will be seen elsewhere. The second innovation followed the end of the display, when the team sometimes offer an additional flypast. But instead of a traditional nine-arrow flypast, six aircraft flew a topside pass with red white and blue smoke whilst the remaining three drew the figure 100 in red, white and blue in the background. This is not listed as a routine display item by the Red Arrows but may, perhaps, be seen at the shows selected to celebrate the RAF centenary. As well as the Chinook, Juno and Jupiter helicopters, this RAF finale included the return of the Grob Tutor display and ended with noisy Eurofighter Typhoon. Less commonly seen contributions were a series of flypasts including a trio of Grob Tutors from the University of Birmingham Air Squadron; a single Grob Prefect T1, a Shorts Tucano T1, a formation of four Hawk T2s from RAF Valley and an Airbus A400M 'Atlas'. Of all the flypasts, the most emotive was that by a Tornado GR4. At first there was a slow flypast with wings forward and this was followed by a fast flypast with wings swept back. The F-35s which will replace the Tornado have already started to arrive at RAF Marham so it is realistic to wonder if this was the last display by the type before it leaves RAF service. If so, it will be a huge disappointment for air enthusiasts who already mourn the loss of these swing-wing fighters from the regular airshow circuit. These and the other flying and static displays are listed in the table. When airshows are reviewed there is usually a commentary of the traffic. The organisers have done a huge amount to ease traffic issues, with alterations to road traffic patterns and several alternative parking areas to separate the tens of thousands of vehicles into more manageable tranches. But whenever 60,000 people descend on a single venue: and when 60,000 attempt to leave a venue at more-or-less the same time, there is bound to be congestion. Regrettably queues did begin to form very early and some people suffered traffic issues that caused them to miss some displays or, in extreme cases, to abandon their attempt to arrive at all. Regrettably, and not for the first time, a serious road traffic accident, unconnected with the show, then closed one of the major exit routes at exactly the time visitors were beginning to leave. Accepting that it is natural to judge a day on the whole experience, of which arrival and egress are an integral part, it would be a shame if the show were to be judged on things like the impact of road traffic accidents which, however frustrating, were not in the power of the organisers to change. Instead, consider the day within the showground. Some come to an airshow to enjoy the flying: indeed many arrived early, found a spot on the crowdline and stayed there until making for their cars as soon as the displays were over, without visiting other parts of the showground. Others took a leisurely and detailed look at the many exhibits including the static aircraft, the displays in the hangars and the trade stands, gazing up when a specific display was overhead. For most, the event is a combination of the thrill of the air displays, the learning from the many exhibits, and the emotion that the evident dedication of those who fly, and those who teach, instil in everyone, sometimes by provoking memories, sometimes by engendering an understanding of the security that a relatively few people provide for the rest of us. Whatever the motivation that brings visitors to events such as the RAF Cosford Air Show, most will surely leave with a better understanding of the mechanical and human power, ingenuity and dedication that combine to constitute the RAF. The people who offer their time to open an operational base so that the public can see and learn from them deserve our thanks: and our encouragement to do it again next year. The dull weather and low cloud did not detract from the enjoyment of most of the RAF Cosford Air Show. However, poor weather here and elsewhere did reduce the number of displays and rain from about 4 p.m. meant a very wet Apache display and premature end to the day. A road traffic incident then hampered the get-away afterwards, leaving many drivers quite angry, no doubt to the frustration of the organisers who had made huge efforts to improve the traffic handling this year following complaints after previous shows. Hopefully the show will not be remembered for the weather and the egress, but for some impressive flying right from the opening fly-past by the Airbus A400M; the flypast by the Red Arrows with the King Air; the debut 2016 display of the Chinook, the first display of the season by the solo Apache with pyrotechnics and many others. The themes for the RAF Cosford Airshow 2016 were 'Speed', 'Training' and the 75th Anniversary of the Air Cadet Organisation. The key theme was a celebration of Speed and showcased the evolution of the jet engine. The theme marked the 75th anniversary of the inaugural flight of Britain’s first jet engined aircraft, the Gloster E.28/39. The evolution of British jet engine technology was exhibited in a special hangar display, which also marked the 20th anniversary of Sir Frank Whittle’s death. Following this same 'Speed - evolution of the jet engine' theme, the Bristol 188, Fairey Delta II, Avro 707 and Hawker Siddeley Gnat T1, all of which played a vital role in the development of British aviation technology, were outside at various points across the air show site. The Bristol 188, known as ‘the flaming pencil’ because of its long, sleek design, and intended as a supersonic research aircraft, was one of the main attractions amongst the static aircraft which also included, for the first time, the Museum's new Vickers VC10: the fastest ever sub-sonic airliner. RAF Cosford is the home of training for RAF engineers and technicians, as well as military photographers and fitness instructors. The air show gave the Royal Air Force the opportunity to showcase the diverse roles within the Service, mostly in ground-based exhibitions. Mustang: North American P-51D, 'Red Tail' (ex- ’Jumpin Jacques') cancelled. In the air, despite the weather and the reduced flying schedule, several displays did impress. Lauren Richardson threw her Pitts around the sky for the third time in the same day, having previously flown at two other shows, and the Gazelle Squadron flew their debut 2-ship display in less than perfect weather conditions, with another 2 Gazelles on static. The show was one of only 11 public venues listed to get the RAF Chinook display this year, always a crowd-puller and pleaser. Another impressive rotary was the only European flying display to make it to the starting line, the Belgian Agusta A109, unfortunately not the one in the special paint scheme. The planned Meteor pairs display did not happen, because the operators cancelled all displays this season, but there were vintage jet displays by the Jet Provost Display Team in the person of Ollie Suckling flying the T.5A XW289, a late substitution for the intended T.3 XN637, and the Norwegian Air Force Historical Squadron's MiG-15. Per Strømmen flew a generous number of topside passes in this example of a cold war jet from the 'other side', probably the most widely-produced jet aircraft ever, presented in the colours of Yuri Gagarin's Red 18. Vintage jet flying displays were also to have included the only airworthy Sea Vixen in the world, but this was weather-bound and unable to reach the venue, and the Gnats, who were weather-bound in Bristol. The Great War Display Team flew their new 2016 routine complete with pyrotechnics and really impressed, winning the 'Hartree Memorial Trophy' Best Display award. The RAF were unable to jump in with the Falcons, again because of the weather, and the Dakota was unable to fly because it is still unserviceable, but the other RAF contributions, the Typhoon and the Red Arrows, were able to fly their flat routines under the low cloud. There was a big build-up before the show for the flypast by the iconic B-52. The B-52H, the US Air Force's long-range, large-payload multirole bomber, is used as both a strategic nuclear and conventional weapons platform and has seen action in numerous conflicts around the globe. The B-52 is a huge aircraft, with a length of nearly 50m and weighting a mighty 220,000kg. However, the much-anticipated B-52 is only cleared to fly at shows above 1,000, which was above cloud level, so the Stratofortress was heard but not seen. Hugely disappointing. An RAF A400M was flown by Tim Dunlop earlier in the afternoon and there was a single pass by a Hercules in standard livery: the special schemes being committed elsewhere. Other displays are detailed in the table, together with a note of those planned but absent on the day, and the list will not be duplicated verbally here, but worthy of special note was an unusual combination flypast by the Anson and the T6 and a pairing of the Scout with its modern counterpart, the Apache. Let's be honest, this wasn't the greatest RAF Cosford Airshow. Many of the problems were not the fault of the organisers: they could not be predicted or helped. The road accident that hindered travel away from the show, for example, could happen anywhere. The weather was the one factor that had most impact on everyone - the decreased vision, the dull photos, the difficulty seeing some aircraft against the gloomy skies and especially the cancellations caused not only by the conditions here but the weather elsewhere as well. The poor weather had been forecast but there was nothing RAF Cosford could do to change it. There are some other things that the show will probably want to look at before the RAF Cosford Air Show 2017. In 2015 the main commentator, Sean Maffett, was pretty poor. The relief that year was Peter Dickson, who gave a comedic commentary when Rich Goodwin flew his display and was much lauded for it. He should have quit whilst the going was good, because in 2016 he joined Jonathan Ruffle, Gareth Attridge and Radio DJ Claire Sturgess in an even worse joint attempt to describe happenings at the show. Apart from the inane nature of some of the comments, they seemed to forget the main purpose of the commentary team is not only to elaborate on what is happening now, but to keep the crowd advised of what is going to happen next and later. The audience seemed to have to depend more on whispers up and down the crowd line, originating from others gaining their information from Twitter or Facebook messages. A new commentary position and new commentary team are a must for 2017. The other disappointment was that the excellent array of static aircraft were again arranged in a rather higgledy-piggledy way around the site, mostly in cluttered positions. This is not unusual for the show but it is a huge contrast with some other shows, Duxford for example, where the statics are lined up with clear country backgrounds for a clear view of the exhibits - and clean photographs. Changing this would require considerable re-organisation of the layout but if RAF Cosford is going to continue to be attractive to enthusiasts, and to live with the new RAF show at Scampton, this is the sort of thing the volunteers at the base will need to consider. The team at RAF Cosford work tirelessly for a long time to make the show as good as they can make it. 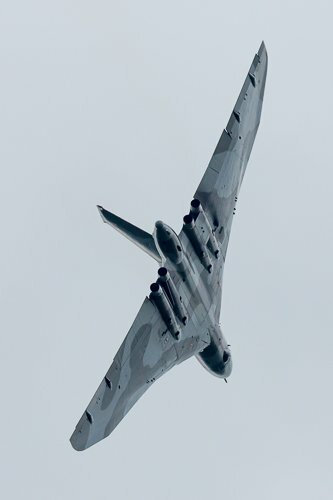 They must be applauded for getting such a wide range of static exhibits and as many displays in the air as they did in very unfavourable conditions. They do tackle challenges, such as the parking, which has evolved and improved over the years, and they do the very best to attract a suitable variety of displays. For next year they will, no doubt, try to avoid clashes with continental airshows to ensure the availability of European aircraft and will take on board other comments which they themselves have invited. All is looking promising for a first class show in 2017, as long as uncontrollable factors such as the weather and any further tightening of the regulations don't get in the way. An impressive complement of military and civilian aircraft helped the 55,000 visitors celebrate this year's main theme: the 70th anniversary of VE Day. The organisers made some determined efforts to make the 2015 show even better than the sell-out or near sell-out shows of earlier years. To achieve this they concentrated on a change in traffic management to make coming and going easier; moving to advance-ticket only, also easing traffic flow before the show, and broadening the variety in aircraft attending. And it seems to have worked, with lots of interest in the display items and easier traffic flows on the day, although there will need to be some fine-tuning in 2016 to make sure the apportionment between on-site and the newly-introduced off-site public parking is seen to be fair. The result was that the biggest RAF show was the best it has been for a very long while, despite the determination of the weather to spoil the organisers' efforts. The show was also unlucky with some high-profile late cancellations including RAMEX Delta, the German Navy P-3C Orion, the Polish Air Force MiG-29 as well as the Polish Sokol, intended for the SAR-themed exhibition. The intended Belgian F-16, the camouflage Typhoon and the Anniversary Chinook were also non-starters for technical reasons and the Tutor was weather-bound at Cranwell, although all four: F-16, Typhoon, Chinook and Tutor were substituted. The Bulldog was weathered in, so the Tutor flew a totally solo display in place of the intended pairs arrival. The Hercules was also not fit enough to perform its planned flypast although the RAF's Voyager did manage its single and very impressive pass. In addition to the main VE70 theme, a secondary theme was Search and Rescue through the ages, which also had its static area as well as flying representatives. 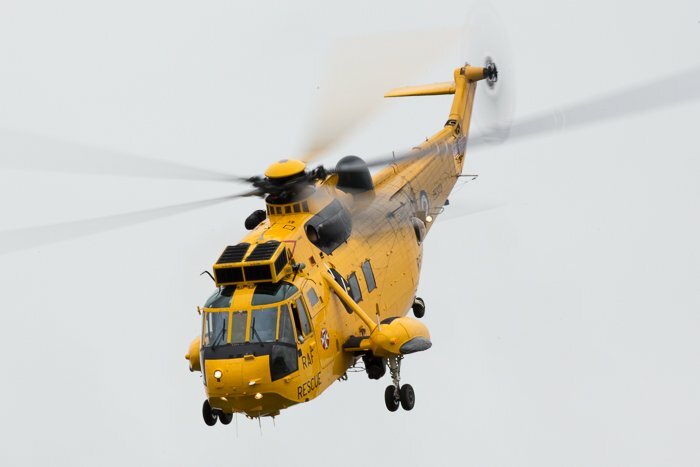 The static area was supported by contributions from Europe including an Italian AgustaWestland HH-139A, a German Sea King Mk41 and a Dutch NH90 as well as UK entries from the restored Westland Whirlwind HAR10, RAF Griffin HT1 and the EC135 Air Ambulance. Displaying in support of the theme were Consolidated PBY-5A Catalina and 22 Squadron RAF Valley's active-service Sea King. One of the unintentional themes was fond farewells, but farewells there were. The RAF Sea King HAR3 bowed out at the end of its last public display before the disbandment of the Squadron, and the imminent transfer of the SAR role in this area to Bristow Helicopters, with a long, emotional wave and bow farewell sequence and the Vulcan flew its last ever Cosford display in its final flying season. The show's original line-up was studded with novelty and a generous splattering of foreign aircraft but regrettably the RAMEX Delta Mirage pair, the German Navy P-3C Orion and the Polish Air Force MiG-29 were amongst the last-minute cancellations. Nevertheless, two rarely seen combinations that did display were Dan Griffith in 2Excel's Oil Spill Response Boeing 727 with The Blades and a pair each of Hurricanes and Spitfires from the BBMF within the V of the Red Arrows marking the 75th anniversary of the Battle of Britain. Also near-unique to RAF Cosford, a pair of GR3/TR Jaguars performed a ground run, stopping for photographers and others who wanted a chance to see this enigmatic ground-attack aircraft not just in static positions around the grounds but also in action. A highlight at this, as any, show was Rich Goodwin with another remarkable display in his Pitts. Talking visitors through that display was the unmistakeable Peter Dickson, whose wit and novelty was certainly the commentary highlight of the day. Hopefully not too many people really believed that Rich has to fly half his display upside down because he painted the union flag the wrong way up, or that his dog helps him with the flying on long journeys. At least his misinformation was deliberate and comic, whereas the inaccuracies from the base team of Sean Maffett and Jonathan Ruffle were just mistakes. True to the key theme of the show, the finale was a VE70 set-piece featuring the Anson of the Classic Air Force, the Vacher Mk1 Hurricane R4118, Cliff Spink in Spitfire Ltd's Buchon and Lars Ness in the Norwegian P-51D "Sharkmouth" Mustang, now in its 112 Squadron livery, each performing in the set-piece and individually. There is one airshow each year at RAF Cosford, generally towards the middle of June. 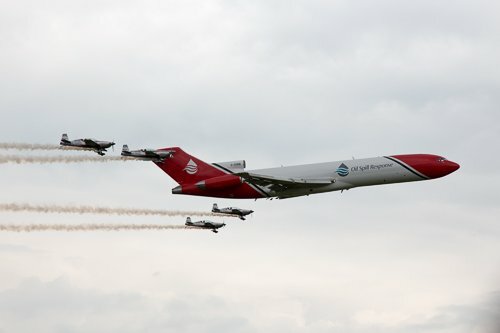 The RAF Cosford Airshow has previously played second fiddle to the larger and traditionally better-favoured show at RAF Waddington. In 2015 the Cosford show was the biggest RAF show in the absence of Waddington from the airshow calendar during runway works. During 2015 Waddington was withdrawn altogether as an airshow venue, leaving RAF Cosford in top place for RAF. The RAF Cosford airshow features military and civilian aircraft, modern and heritage, flying and static. There are arena demonstrations, military displays, a fairground and craft and memorabilia shops. During the show, the RAF museum with some unique displays is free to enter and some museum exhibits, which included the TSR2 prototype in 2015, also get a rare airing, so giving visitors an opportunity to see historic aircraft in a more natural and photo-friendly environment. Other vintage jets displaying were Jon Corley, chief pilot of Classic Air Force in their Gloster Meteor NF11 and Dan Arlett in Jet Provost T5 XW324, which was not programmed but was flown as a tribute to former Flying Display Director Bill Hartree, who had died in the previous November. Modern jets included welcome contributions from abroad: a replacement Belgian Air Force F-16AM Fighting Falcon, minus flares, flown by Cdt Tom “Gizmo” De Moortel and Capt. Julien “Teddy” Meister in a Swiss Air Force F/A-18C Hornet, with a display so impressive it won the Hartree Memorial Trophy, introduced in 2015 as a memorial to Bill Hartree, for "the most accurate, safe and polished flying" during the show. The RAF contribution to the fast jet displays was Johnny Dowen with his vigorous outing in the 29(R) squadron centenary FGR4 Typhoon, which was also flown by Flt Lt Ben Westoby-Brooks as a replacement for the intended camo Typhoon for the synchro display with Flt Lt Antony Parkinson MBE in the BBMF's Mk. Vb Spitfire AB910. As well as the BBMF's contribution to this and the Red Arrows formation, their Dakota made its usual dignified contribution. Other props included the Wingwalkers who put down their usual smokescreen. Why, oh why, do they use so much smoke? Amongst the rotaries, the Royal Navy offered a welcome and increasingly rare outing by a Lynx, taking their HMA8 through its paces but the Chinook's intensive and aggressive demonstration of the agility of this massive beast is most people's favourite. 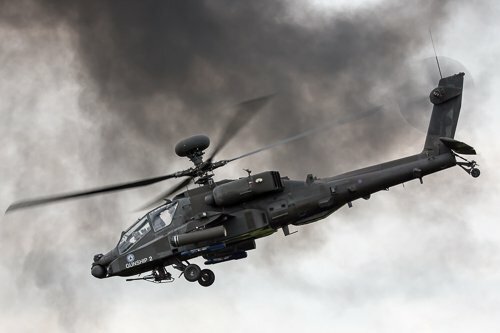 However, they were taken to the line this year by the Apache AH1 duo, giving one of only a few displays by the team in 2015 complete with bright and loud pyrotechnics as Gunships 1 and 2 worked through a realistic scenario seeing off the baddies in traditionally competent RAF style. The six hours of flying displays, backed up by static aircraft displays, are the focus for most, but there are always other treats on the ground at airshows during, before and after the air displays. One of the ground attractions provided at RAF Cosford but not common elsewhere is the STEM (Science, Technology, Engineering and Maths) hangar, especially appealing to youngsters, where visitors can see and interact with STEM displays. Backing up the VE70 theme, a hugely popular Victory Village was filled with re-enactors representing civilian and military encampments at home and abroad. I'm sure I saw General de Gaulle. 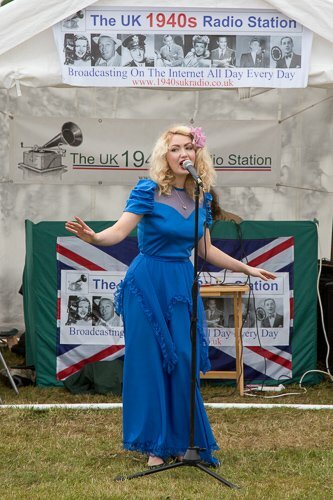 And not far from the re-enactors, musical entertainment was virtually continuous adding to the VE70 atmosphere. Shows in earlier years had been less high-profile and rather in the shadow of big brother RAF Waddington. Foreign participation had been minimal and road traffic problems had tended to be a constant curse, despite the close proximity of the base to the motorway and major road networks. These issues were addressed for 2015 which almost certainly offers a better example of the shows to expect in 2016 and future years. These shows do not happen by themselves. At RAF Cosford the show is the result of the efforts of the 1500 RAF Cosford personnel, reserves, recruiters and cadets. All credit to them for the 2015 show and we look forward to the results of their meticulous planning for 2016. One of the easiest shows to access, Cosford is off the A41 and only a mile from junction 3 of the M54 with easy access to the motorway network via the M56, M5, M6 and M40. Even so, the roads in the area can become very busy indeed because of the popularity of the show. To get close to the site, use the post code TF11 8UP. Not all sat nav systems recognise this post code: the alternative is WV7 3EU. Follow local show directions in preference to the sat nav once you get close. National Express have direct coach services to Telford and to Wolverhampton, both of which are about 7 miles from the show site. The local 892 bus service runs from Wolverhampton and stops at Cosford but it does not usually run on Sundays and the nearest stop is at a garage about a mile from the show site. The easiest way to get to Cosford using the coach is to go as far as Wolverhampton and get a train from there to Cosford station. Several companies have special services direct to the show. Cosford has its own station, which is only a very short walk from the show site. Trains from Cosford go to Wolverhampton (about 20 minutes), Birmingham (about 30 minutes) and, via Birmingham, to London (roughly 3 hours) and other major cites. Click the blue Expedia name for a list of hotels and guest houses near the show. The venue is already built into the link but when the list comes up you do have to enter your dates and adjust the number of rooms and guests if necessary. The International Hotels Group have a Holiday Inn in nearby Telford; there are four Premier Inn hotels in or close to Telford, between four and eight miles from the show and two in Wolverhampton about 13 miles away.